Moss Park, the palatial residence of William Allan. Photo taken in 1897, collection of the Toronto Public Library, r- 3661. William Allan was one of the most influential men in the town of York (Toronto). His mansion, Moss Park, was perhaps the grandest residence ever built in the town. If it were in existence today, it would be considered an architectural treasure. However, there are very few photographs of this magnificent structure that have survived. I found this deficiency to be very surprising, especially considering the number of photos that exist of homes of much lesser importance. Gathering visuals to support this post involved considerable searching. William Allan was born in 1772 on Moss Farm, in Huntly, near the city of Aberdeen, Scotland. Immigrating to North America, he eventually settled in Niagara, where he gained wealth and influence by selling supplies to the British garrisons at Niagara and York, for a Montreal company. In 1795, he relocated to the colonial capitol of York (Toronto), where he was granted a town lot and 200 acres of land. Due to the experience he acquired while working for his previous employer, he had an advantage over the other businessmen in the town, and his wealth increased substantially. In 1797, William Allan and Alexander Wood formed a partnership and opened a general store that sold supplies to the garrison at Fort York. The same year, Allan sought to exchange his town lot for property closer to the lake. In 1798, he was granted title to land directly beside the shoreline. On the north end of the property, on King Street, he built a home. On the south end, beside the water, he constructed a wharf — Merchant’s Wharf. It was at the foot of Frederick Street, and was one of the earliest docking facilities for large sailing vessels. The partnership with Alexander Wood ended in 1801, and Allan continued his business enterprises on his own. He was appointed collector of customs in 1800 and the postmaster general in 1801. His first home, on southeast corner of King and Frederick Streets, was a short distance north of the shoreline. Today, due to landfill, the site is quite a distance from the lake (see map below). His residence served as the post office and custom house. Allan became an officer in the York Militia during the first decade of the 19th century. During the War of 1812, after the American invaders occupied the town in 1813, he performed a major role in negotiating the terms of surrender. Although his store was looted, he received compensation following the war, which provided funds for further financial ventures. In 1819, Allan purchased the 100-acre park lot #5 from Surveyor General David William Smith, who had returned to Britain not long after Lieu. Governor Simcoe granted him the property. Allan now owned the land from Queen Street north to Bloor Street, between Sherbourne and Jarvis Streets. Other than Queen Street, which was then named Lot Street, the other streets did not exist, as the land was forested rural property to the east of the town. On the southwest side of the estate, there was a ravine containing a gurgling brook, which added to the rural quality of the site. In 1827, he commenced building a grand mansion on the south end of the park lot, which contained thick stands of pine. It was west of Sherbourne, east of Jarvis Street, and between Queen Street and today’s Shuter Street. The home’s main entrance faced east toward to where Sherbourne Street now exists. Allan named his residence Moss Park, after his birth place. The large south portico on the south side, facing Queen Street, was very grand, but it was mainly ornamental. It had no steps leading to it or a carriageway. It was meant to impress those who passed in the distance, on Queen Street. The east facade, which faced Sherbourne Street, was the main entrance to the residence. In 1833-1844, Allan hired John. G. Howard to design additions to the mansion, which included a Grecian-style porch over the front door. It possessed four Ionic columns, two-storeys in height, with a pediment above them. In 1841, a bath was installed with hot and cold water. Allan passed away in 1853, and his son, George Allan then resided in the house, until his death in 1901. The City of Toronto eventually purchased the property, but unfortunately, the grand mansion was demolished shortly thereafter (c. 1905). The home of William Allan on the southeast corner of Frederick and King Street East. Sketch from John Ross Robertson’s book, “Landmarks of Toronto,” page 252. The corner of King Street East and Frederick Streets, where Allan’s first home was constructed. The map illustrates how far from the lake the site is today. The land south of Front Street is landfill. Map depicting the mansion, Moss Park. The map is after the late-1830s, as the name “Queen Street” appears. Moss Park is north of Queen Street, with Sherbourne Street on the east (far right-hand side) and Jarvis Street on its western side (far left-hand side). The north service wing on Moss Park is visible, as well as the east and south porticos. The map also shows Hazelburn, the residence of the Jarvis Family. The brook cutting diagonally across the property is shown in blue. The water colour by John G. Howard illustrates the rural qualities of Moss Park when it was built to the east of the town of York, between the years 1827 and 1829. The two people in the foreground, walking past the estate, are on Lot Street (Queen Street). One of them is pointing to the mansion, Moss Park. (Left) undated portrait-photo of William Allan and his signature, Canada Archives, e 10965833-v8 and the right-hand photo, his wife Leah Allan. Maps authorized by George Allan in 1854 to sell small plots of land on the estate he inherited in 1852. Toronto Public Library, r- 144 (left-hand map) and r-2 (right-hand map). This photograph of Moss Park in 1880, from the collection of the Toronto Public Library (r-3657). It illustrates the forested appearance of the estate. The sketch of Moss Park from John Ross Robertson’s book, “Landmarks of Toronto,” page 560. It was reproduced in the Evening Telegram newspaper on August 3, 1889. It depicts the east and south facades of the mansion. The above copy of the sketch is from the Toronto Public Library, r- 365. Ornithological Museum (nature museum) in the former dining room of Moss Park. This is the only photo that I was able to find that hints at the grandeur of the interior of Moss Park. Toronto Public Library, r- 3663. Today, those who fought in the Second World War are diminishing in number. However, my generation, who were children during the war years, are also decreasing in number. I remember World War II vividly as it was important part of my childhood. Today, on Remembrance Day, I cast my mind back to 1945, when the first service was held in my school after the war ended. It was very different to the services of today. One of the reasons was the school system in the 1940s. In that decade, children were expected to pass all subjects in order to be promoted to the next grade. The most commonly asked question in the schoolyard on the last day of June was, “Did you flunk?” (fail). Flunking meant that you repeated the entire year, in a classroom with those who were at least a year younger than yourself. If a child flunked several times, the accumulative effect was even more humiliating. In a grade-eight classroom, it was not uncommon for a fifteen-year-old to be in a class with those who were twelve or thirteen. When these student turned sixteen, they were able to quit school without their parents’ consent. During the 1940s, many of them enlisted in the armed forces. The legal age to enlist was seventeen, but it was was a decade when record-keeping was poor, and if a teenager declared that he was seventeen, and looked to be that age, he was generally accepted. This situation greatly affected the first Remembrance Day services held at my school after the war ended in 1945. Many of the names of those had perished had attended the school only a year or two before. We had seen them in them schoolyard and knew them personally. Some of the other names were of teachers who had enlisted. Many of us remembered them too. In my school in York Township (now part of the City of Toronto), there was no auditorium where a Remembrance Day service might be held, so we all gathered in the basement. We sat on rows of benches that were used each day for those who brought their lunch to school. I still remember the tears on the cheeks of my teachers as the names were read aloud of those who had been killed in action. I can still picture the handkerchief my teacher kept tucked in her sleeve as she retrieved it to wipe away her tears. There were students sitting on the benches who had lost a father or older brother. There were few families in our neighbourhood that had not suffered the loss of a loved one. Husbands, brothers, cousins, friends and neighbours had paid the supreme sacrifice. Some families had lost women who had served as nurses or support staff. Clergy had been killed while ministering to the needs of dying men, or praying with others, young and old, who were severely traumatized, shell-shocked or dying. Doctors and nurses had died on the battle lines. Remembrance Day in 1945 was one that I will never forget. In 1945, many of those who survived World War II were in their early twenties. I can still picture them marching in the CNE’s Warriors’ Day Parade that year. Their youthful faces did not reveal the horrors they had suffered. Those who had lost an arm marched proudly, while others pushed the wheelchairs of those who had lost a leg. Many of them looked like teenagers. Today, the veterans of the Second World War are elderly. Their sacrifices are viewed by some as belonging to another era, part of a history of a bygone age. For those of us who remember the war years, it is very different. Today, each November 11th, I try to attend the services at Toronto’s Old City Hall. On this occasion, I remember my first service in 1945, and recall the harshness and community camaraderie of the war years — rationing of food, the war’s uplifting songs, neighbours consoling neighbours, the morale-raising war-movies at our local theatre, fund raising to send gloves and cigarettes to the troops, and the neighbour’s house where the blinds were lowered after they received a telegram. For a link to thoughts on Remembrance Day in 2011. A link to an obscure war memorial inside Toronto’s downtown Bay Store. A link to the history of the cenotaph at the Old City Hall. Toronto’s first Swiss Chalet on Bloor Street West, the entire block of buildings in the photo demolished in 2002. Photo from the Toronto Archives, taken between the years 1980 and 1998, Series 1465, File 10280, Item 0019. The first Swiss Chalet opened in 1954 at 234 Bloor Street West, near the northeast corner of Bloor and Bedford Road. It was the beginning of a restaurant chain that was to become an icon of Canadian family-style dining. It became so popular that it was reported that a Canadian once jokingly quipped, “If America is such a great country, why don’t they have a Swiss Chalet?” This was prior to the chain opening outlets in the United States. The founder of the chain of restaurants was Maurice Mauran of Montreal, in partnership with another businessman. In 1948, before opening in Toronto, Mauran introduced his barbequed-style chicken in Montreal, in his Chalet-Bar-B-Q restaurants. Apparently he was inspired by the Swiss method of cooking chickens, which consisted of skewering the birds on a spit and roasting them over an open flame. Because the birds rotated on the spit, they cooked in their own juices. The first Swiss Chalet was located on busy Bloor Street, in close proximity to Varsity Stadium and Varsity Arena. As it was an instant success, two more restaurants were opened. One of them was at 362 Yonge Street, which still exists, and another one was on Yonge Street south of St. Clair. The decor in the dining room of the restaurant on Bloor Street contained carved dark-wood panelling, dark ceiling beams, and small fake windows with frilly cotton curtains. It was an attempt to create the appearance of a Swiss mountain hideaway, such as in the children’s story, “Heidi,” by Joanna Spyn. As a teenager in the 1950s, I dined in all three of these sites, mainly when attending movie theatres located within walking distance of them. The chickens were barbequed in an oven containing glowing charcoal, which imparted their unique taste. The prices were reasonable, and being teenager with a bottomless gut, I always ordered the half-chicken dinner. The restaurant on Bloor Street also had a banquet room in the basement level, for private functions. I was in this space on one occasion, with a group that performed in Varsity Arena, later in the evening. There were about 35 of us, and we enjoyed the meal immensely. Before cooking, the chicken were rubbed with salt, and then, roasted for an hour and fifteen minutes. At the Bloor Street site, in the 1950s, the chicken was served with fries or a baked potato, the fries cut daily rather than previously frozen. The meal also included dipping sauce and half of a toasted hamburger bun. A small bowl of water, with pieces of lemon in it, allowed a patron to rinse the fingers after eating. There were no ribs or other items on the menu; these were added during the years ahead. I enjoyed the chicken immensely. However, I recently read some online reviews, and although there were many who enjoyed the meals, there were some that did not. However, I did not read any comments that indicated that the reviewers were aware that the chicken was roasted over real charcoal. Some compared it with St. Hubert chicken, which was roasted, not barbequed, and the sauce was more like home-style chicken gravy. I enjoyed it as well, but I preferred the chicken at Swiss Chalet. In 1963, Mauran opened a Harvey’s on Bloor Street, a few doors west of his Swiss Chalet. In 1977, the chain was bought by Cara Foods, and was operated by Toronto-based Foodcorp Limited, a subsidiary of the parent company. In 2002, there were 190 outlets in North America. Mauran later became a highly successful mutual funds manager, possessing residences in England, Monaco, and Ft. Lauderdale. Sources: everything2.com, www.thestar.com (Bill Taylor) and www.blogto.com (Chris Bateman). View gazing east on Bloor Street c. 1912, the north side of the street (left-hand side of photo) containing large residential homes. Bedford Road is directly across from Varsity Stadium. Structures were added across the front of these homes, where the lawns were, to convert them into commercial premises. The building containing the first Swiss Chalet does not appear to be in one of them. It is likely that the home on the site was demolished to create a new building. Toronto Archives, Fond 1244, Item, 0528. The surroundings of the first Swiss Chalet at Bloor and Bedford Road. The roofs of some of the old homes remain visible. Toronto Archives, Series 1465, File 10280, Item 0019. Gazing toward the northeast corner of Bloor and Bedford Road in October 2016. The 32-storey condo (1 Bedford) occupies the block where the Swiss Chalet and the Harvey’s were located. The Swiss Chalet at 362 Yonge Street, which was among the first outlets in Toronto. Photos taken in 2014. While examining files in the Ontario Archives (#10005533), I discovered this photo, dated 1952. The camera is pointing north on Yonge Street, from south of Dundas Street. During the 1950s, Yonge Street was the city’s entertainment district, with its bars, restaurants and theatres. It was the last decade that the street’s movie theatres were “the kings” of entertainment. By the 1960s, they were beginning to suffer from lower attendance due to television. In the photo, the marquees of the Imperial Theatre (Ed Mirvish) and the Downtown Theatre (demolished) are prominently visible on the east (right-hand) side of the street. The site of the Downtown Theatre is now a part of Dundas Square. If you know where to look, you will see the rounded facade of the Brown Derby Tavern at Yonge and Dundas and the red-brick Ryrie Building on the northeast corner of Yonge and Shuter Street. This is where the Silver Rail Tavern was located. The building still remains today, although the Silver rail is gone. The clock tower on the St. Charles Tavern is visible. The building was a fire station that became a tavern (bar, restaurant, night club) and is now a condo. In the distance, Eaton’s College Street can be seen, as well as the Toronto Hydro Building at Yonge and Carlton. The dome on the roof of Maple Leaf Gardens is to the east of the Hydro Building. In examining the photo, I found it remarkable that so many of the 19th-century building on Yonge Street have survived. In most instances, additions have been constructed across the front of them for commercial purposes. Many of the old buildings remain today, functioning as modern shops. The west side of the Hugging Tree in October 2016, the Black Bull Pub in the background. It is not often that we find graffiti art painted on trees, or in the case of the “Hug Me Tree,” (Hugging Tree), on a tree stump. This favourite piece of art is located on the north side of Queen Street West, a short distance west of Peter Street. It appeared for the first time in 1999, painted by Elicer Elliott, a graduate of Sheridan College. He has since become one of Toronto’s best known graffiti artists. I highly recommend that you Google his name to see further examples of his work. After completing the “Hug Me Tree,”“ Elicer Elliott placed a tag on the tree – “H.U.G.”- the name of his graffiti crew. As an afterthought, he added the “Me” to the tag, and Queen Street’s famous “Hug Me Tree” was born. The hugging Tree in 2012. In 2008, the tree toppled over onto the pavement. It may have been hit by a car, or pushed over by overly exuberant patrons of the nearby Black Bull Pub. Whatever occurred, the city decided to dispose of it. However, a group of concerned citizens prevented the tree from being carted away. On June 15, 2009, after the tree was restored, it was returned to its original location. It is now weather-proofed and has a metal base to secure it. The next time you stroll along Queen Street West, on the section of the street east of Spadina, take a few moments to appreciate this example of graffiti art. Give it a hug. Who knows, it may bring you good luck. The west side of the Hugging Tree in October 2016. The Bank of Toronto on a postcard, printed in 1910, camera facing the southwest corner of King and Bay Streets. The streetcar is travelling east on King Street. Photo from the collection of the Toronto Public Library, r-2167. When I was a boy in the 1940s, during the hot summer months, one of the greatest adventures in life was to climb aboard a streetcar on Bay Street and travel to the ferry docks on Front Street. From there, we sailed across the harbour to Centre Island. In my youthful eyes, this outing was high adventure, similar to a story about climbing Mount Kilimanjaro that I had read about in a library book. The author of the tale stressed that the journey up the mountain was as much a part of the adventure as the arrival at the summit. Similarly, the tall buildings lining the canyon of Bay Street were as important (well almost) as arriving at Centre Island. It was on these summer excursions that I first saw the Bank of Toronto at Bay and King Streets. To me, it appeared like a giant piggy bank, and I was certain there was a coin slot on the roof where people dropped their pennies and nickels. I could not conceive of quarters and fifty-cent pieces being dropped into the slot, as such enormous amounts of money were only possessed by millionaires. I might add that eliminating the fifty-cent piece from common currency was a pity. As a child, to receive one of them to spend at the penny-candy-store was akin to possessing boundless wealth. Today, gazing at the photos of the Bank of Toronto, I can understand why it caught my attention when I was a young lad. Its striking architecture dominated the street, and like a finely crafted child’s piggy bank, it was perfect in every detail. Its architects created a structure that was built for the ages, never anticipating that it would eventually be demolished. Its destruction occurred during the decade of great prosperity that followed the opening of the St. Lawrence seaway in 1959. Large vessels were now able to access the Great Lakes, bypassing Montreal, which in those years was the nation’s largest city. 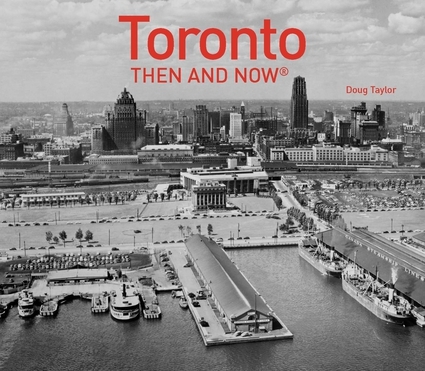 Under the misguided policy of “modern city building,” and with the approval of City Hall, the “old” was demolished to be replaced by the “modern.” In this decade of wanton destruction, many of Toronto’s finest historic structures disappeared. The Bank of Toronto was one of them. In fairness, the Toronto Dominion Bank towers that were constructed on the site are now also considered architectural gems, of the International Style. The Bank of Toronto first opened its doors in 1856 at 78 Church Street, William Gooderham and his son George among its investors and directors. It remained on Church Street until 1862, when its offices were relocated to the northwest corner of Wellington and Church Streets. However, in 1901, the bank commenced planning for a new headquarters, as the area around King and Bay Streets was becoming the centre of financial activity. In 1902, a large plot of land was purchased on the southwest corner of Bay and King – its postal address 55-67 King Street West. The New York City architectural firm of Carrere and Hastings, along with Eustace G. Bird, a Toronto associate architect, was commissioned to design the building. This decision created outrage from nationalistic Torontonians who would have preferred a Canadian architectural company. Construction began in January of 1912, and the bank relocated from Church and Wellington in 1913. The American architects were inspired by the Bourse de Paris (Paris Stock Exchange). The bank building they designed reflected the classical traditions of ancient Rome and Athens, as it resembled an ancient temple. It possessed three-storey Corinthian pilasters (three-side columns) on its north and east facades, which were trimmed with Tennessee marble. However, there was no pediment above the faux columns. The plinth (the base supporting the building) was higher than the people passing by it on the sidewalk. The bank’s interior contained five levels of offices, with a two-storey banking hall, richly trimmed with marble and bronze. In its two basement levels, there were two vaults and several storage rooms. The TD Centre is a much admired building, but it is a pity that the old Bank of Toronto had to be demolished to meet the needs of the modern era. The Bank of Toronto’s former headquarters is now mostly a forgotten part of the city’s architectural history. This is evident by the sparse amount of photos and documentation that appear online. It required considerable searching to locate the photos for this post. The original site of the Bank of Toronto between the years 1856 and 1862, at 78 Church Street. Photo taken on October 5, 2016. The Bank of Toronto’s headquarters at Wellington and Church Streets, from 1862 until 1913. It was demolished in 1961. Toronto Public Library, r-2022. Looking south on Bay Street in 1912, from a short distance north of King Street West. The Molson Bank (the former Cawthra mansion) is on the northeast corner of the intersection, the Union Bank on the southeast corner, and the Bank of Toronto on the southwest corner. Toronto Archives, Fonds 1233, Item 1166. Looking east on King Street from Bay Street in 1913 or 1913. The west facade of the Bank of Toronto is on the right-hand side of the photo. Canada Archives, 054055. Bank of Toronto in 1915, gazing at the southwest corner of King and Bay Streets. Photo from Bibliotheque. Bank of Toronto in 1919, its north and east facades visible. Toronto Archives, Fonds 1231, Item 0846. The ornate entrance of the Bank of Toronto in 1919, on the north facade, facing King Street West. Toronto Archives, Fonds 1231, Item 0846. Gazing north on Bay Street in the 1930s, the tower of the Old City Hall visible in the distance. On the left-hand side of the photo is the east facade of the Bank of Toronto. On the northeast corner of Bay and King is the Cawthra Mansion, which became the Molson’s Bank and later, the headquarters of the Canada Life Assurance Company. Toronto Archives, Fonds 1244, Item 1211. Undated photo of the south and west facades of the Bank of Toronto, from the Canada Archives. Banking hall of the Bank of Toronto, photo from the collection of the Toronto Reference Library, the Baldwin Room. Gazing west on King Street at Bay on September 6, 1941. The Bank of Toronto is on the left-hand side of the photo, (southwest corner of King and Bay). Its north facade is on King Street. Photo from the Canada Archives a054682 v8. View gazing east on King Street toward the intersection at Bay Street in 2014. On the right-hand side of the photo, the black low-rise part of the complex is on the site of the old Bank of Toronto, although it is set back from the corner.